A more smoke-focused follow up to Honey & Co.
Let’s start with the good news. 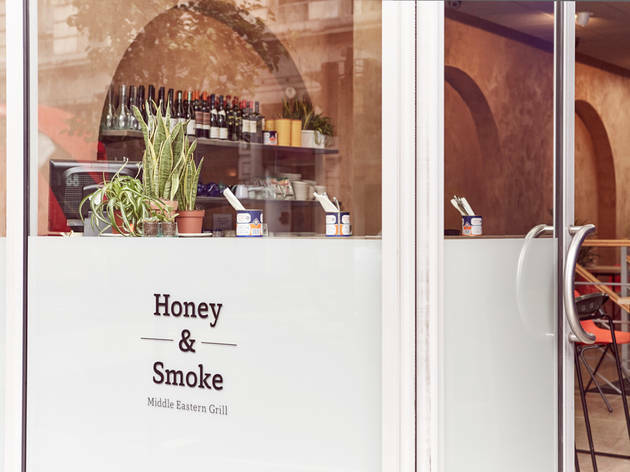 Which is that the food at Honey & Smoke is, on the whole, as great as at the first ‘honey’, aka Honey & Co (the husband-and-wife-team behind it are each other’s ‘honeys’: too cute). 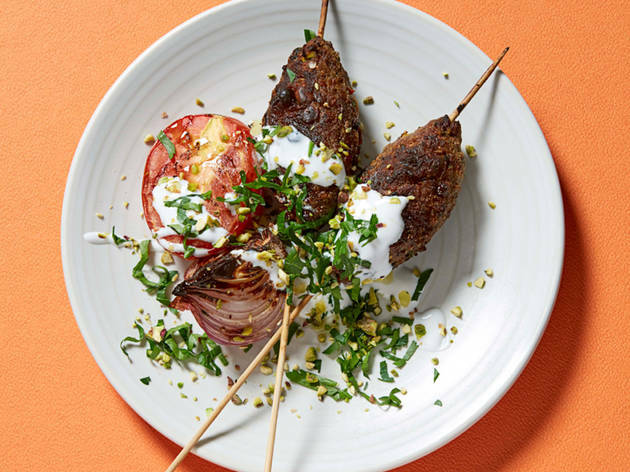 Once again, the ex-Ottolenghi pair deliver the big, bold flavours of the middle east, but this time with more focus on the grill. 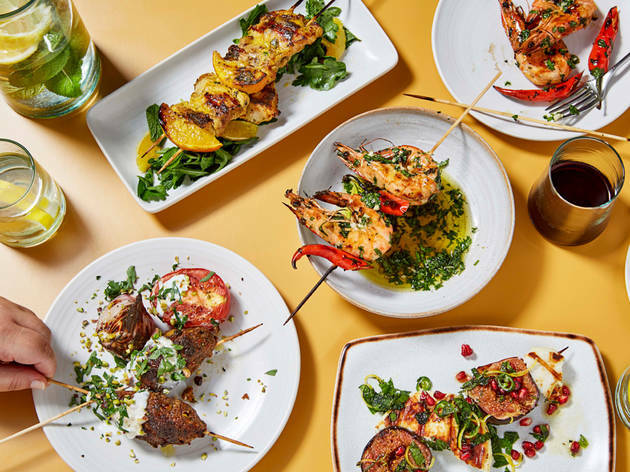 There’s a £32.50 set menu, which allowed me to sample all the mezze (research obvs), the best of which was smoky, silky babaghanoush; perfectly-textured falafel; and crisp-edged cauliflower with tahini and mango chutney. 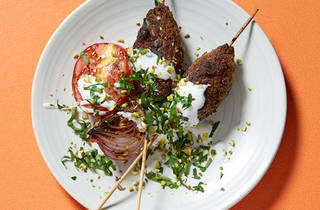 Plus skewers of grilled black figs, their sweetness nicely balanced by soft, delicately salty manouri cheese. Main courses were equally strong: tender hunks of grilled beef shish with wilted greens; a decent plate of marinated and grilled octopus. An unexpected delight was a side of cumin-spiced lentil rice with ribbons of crisp, chewy caramelised fried onion, while of the desserts: the stunning feta and honey cheesecake (borrowed from Honey & Co) remains the best, a warm chestnut cake with thick salted caramel and a blob of sour cream a close second. There were slip-ups, though: oversalted potatoes, undersalted msabaha (whole chickpeas), a too-sharp tomato taboule. These I can forgive. What I can’t overlook (and here comes the bad news) is the setting. While Honey & Co is small and charming, little sis is the exact opposite. 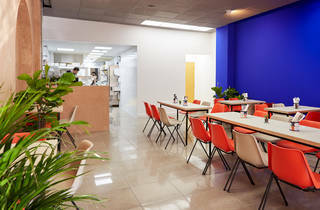 The large, high-ceilinged room smacks of cafeteria: not the swish River Café kind, but the sixth form tech college kind, all plastic chairs, plain tiled floor and harsh lighting. This is fine if you’re a cheap-as-pitta Tel Aviv kebab joint, but not at these prices. That set menu isn’t especially good value, not when you factor in delicious but unasked for bread, olives and pickles, for which they will charge you an additional £2 per person. Instead, eat all the bread (it really is great) and order three starters – one of which should be the falafel, at £3.50 for two – plus two mains, that lentil rice and that cheesecake. Shared between two, that’s a more acceptable £25-28 each. 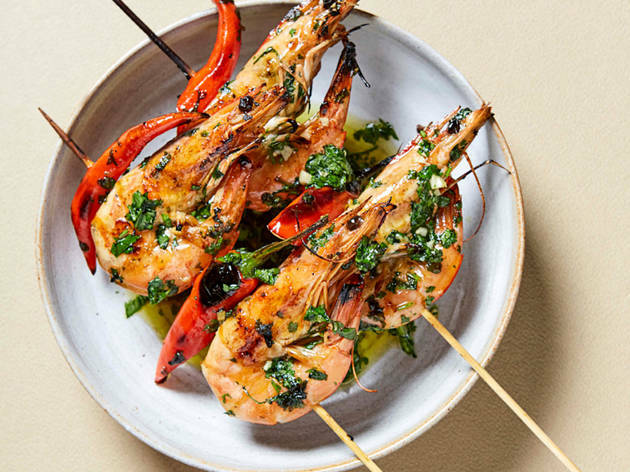 As for the service – even with the caveat that it was opening week – we weren’t impressed when our bread was whisked away without permission, and worse still, we were presented with the bill at the same time as dessert, because ‘the next table was waiting’. Now I don’t have anything against table-turning per se, but the way to do it is to flag it on arrival (we’d been walk-ins). 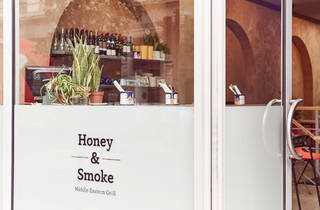 So: Honey & Smoke. It'll be good for lunch once they extend opening hours (due November 2016), but for somewhere sweeter in the meantime, stick with Honey & Co.
Yum yum yum, beyond words thats how delish the food is here! Simple, minimalistic interior, tables and chairs is all you need here. We went as a large group and got the large mezze as a set menu. The variety of food for vegans, vegetarians and meat eater is beyond words. There was a table spread of food and each bit was delicious. 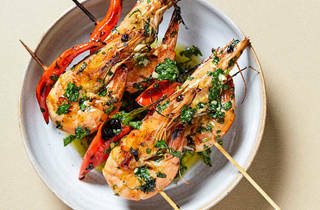 Packed full of flavour, but of course with mezze, it won't fill you up, its merely biting. For mains I got the charred octopus, corn and potato salad, smoked paprika. It was good but the portions are tiny for the price, somehow the food doesn't justify the staggering prices. Sea bream was the best fish dish. Desserts were merely okay, nothing to be wowed about. The lamb chops were probably my favourite, medium rare, cooked to perfection. The pomegranate bellini was a little too dry for my liking. Service was swift, although did feel a bit overbearing at times when they kept asking if we were ready to order. Middle eastern cuisine at its best. If ever around Marylebone don't forget to visit this restaurant. 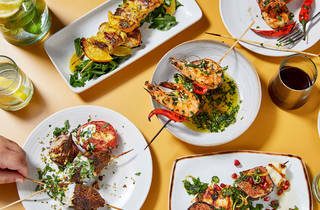 In a simple and modern setting Honey & Smoke reinvents middle eastern cuisine. The menu offers a number of excellent and delicious options. I loved the warm goat cheese with walnut and pomegranates. The sweet potato in embers, almonds date honey and spring onions was delicious too. For main I chose the grilled bream which was well prepared and tasty. Portions are small and even though everything was delicious the price was higher than expected. 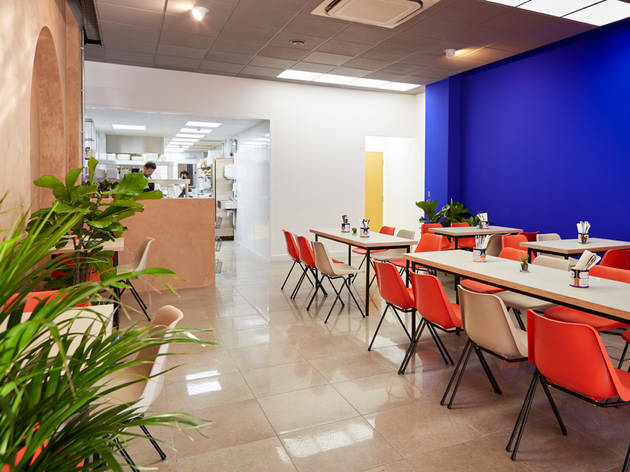 Excellent restaurant with unusual and great value food. Small restaurant and need to book in advance but well worth the planning. Great for veggies too. We were six so opted for the set menu which allows you to try all the mezze (starters), have one main, one side and a pudding per person. At £34.50pp this was about right though if you start getting a few drinks in then this could escalate quickly! My favourite of the 8 mezze on offer was the burnt celeriac with urfa chilli butter & chives - this was flavoursome and melted in the mouth (needless to say I didn't hold back on any of the others). For my main I had the marinated octopus and crispy burnt potatoes. The generous plate of slippery tentacles that arrived did not disappoint: juicy, tender and well seasoned. By the time pudding arrived I was already starting to fill up but naturally found enough room for one of the Honey & Co. cheesecakes (feta cheescake on kadaif pastry with Greek honey - incredible). One of the others had the chestnut cake with salted caramel sauce which, though delicious, couldn't quite match the cheesecake. After the meal Itamar (the owner and head chef!) joined us for 5 minutes which was a very nice personal touch. Highly recommended restaurant! Amazing middle eastern food from super friendly and professional staff. Best falafel and halva in town!